I’m not sure if it was all the Great British Baking Show I watch, or all the time on my hands lately (calm before the busy-season storm), or the fact that I haven’t picked up a new hobby in…well, forever. Whatever it was, a few months ago I decided I wanted to learn how to make bread. From flour, yeast and water to a warm loaf of delicious carbs, I wanted to make it with my own two hands. As a first step on this baking adventure, I turned to what has become a bible of sorts for me in the kitchen, The Joy of Cooking (a 75th Anniversary edition that is just as reliable as I imagine it was nearly a century ago) for a primer on the what and how of breadmaking. Like every other section, the bit about bread is prefaced with all sorts of interesting information on how to cook with yeast and the ins and outs of kneading and how to acheive the right crust and more. And that’s all before you even get to a recipe! Eventually, I felt bold enough to start the baking, so I tried my hand at a batch of white sandwich bread. Simply enough, right? No bells or whistles here, nothing fancy, folks. As The Joy of Cooking proudly states, the recipe is the same one that appeared in their first edition in 1931; in case you weren’t already aware, not much about bread has changed over the millennia. An early attempt at bread. Edible, but not great. Amateur that I am, I tried this first go round without attention to the various tools most bakers surely rely on, and it showed. I managed to kill the yeast with water that was far too hot, and completely mismeasured the cups of flour the recipe calls for (what is a cup? A packed cup? A heaping cup?!) The resulting loaves, though it sort of tasted like bread, was a flat, dense failure. Before I tried again, I took a bit of a detour to Amazon.com and nabbed myself a few tools of the trade: a thermometer to keep track of the warm (but not too warm) water, and a simple kitchen scale where I could more accurately dole out ounces of flour rather than cups. This seemed to do the trick, or at least half of it. The bread did rise (or proof, as our British friends would say, the yeast proving itself), but I managed to over-proof it to the point that though this batch wasn’t as dense as before, it was just as flat. Out of the oven, it deflated like day-old birthday balloons. Mind you, I still ate these two sad attempts; far be it from me to waste all the time and energy it took to get them to the point of something like a loaf of bread! From start to finish, the entire process I’m using – make/knead the dough, rise and punch down, rise and shape, rise and bake and finally let cool – takes roughly four hours or so. Sandwiches taste better when you make the bread yourself. Finally, I started to get the hang of it. Over the course of several weeks, I’d try the recipe again and again, tweaking enough here and there to see slightly different, slightly better results each time. Before long, I was enjoying my avocado toast on my very own homemade bread. 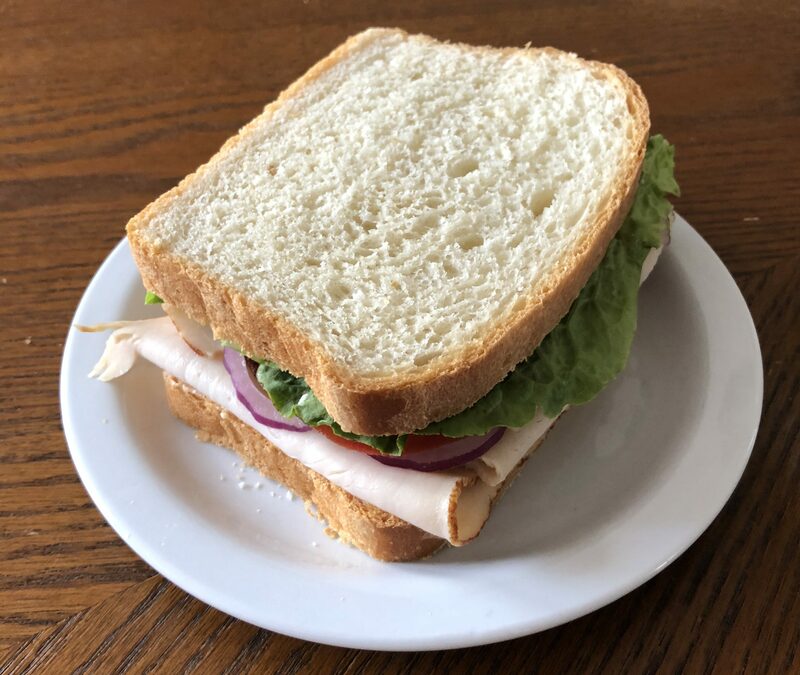 I began thinking of other recipes just so I could use more of the bread I was finally making successfully (turkey sandwiches! open faced pulled BBQ chicken!). Turns out, I just needed to give myself the time to get the bread wrong before I got it right. Now, after a handful of attempts, I know what the dough should look and feel like at every step in order to turn out just tall and just airy enough. Where I used to watch the clock to be sure I was working the dough for as long as the book recommends, now I find my mind wandering as I knead and turn, knead and turn, stopping when it feels right. I’ve settled into a bit of a pattern, making a fresh round of bread every ten days or so. That’s about how long it takes me to go through one batch before I’m ready for something fresh. The other day, I decided the time had come to branch out, so I gave a round of sourdough a try; I even made and developed my own starter! Like the first go-rounds with white bread, it wasn’t a resounding success…but it wasn’t bad, either! That starter is still in my fridge, and I may just give it another go again soon. That, or I’ll learn to make jam.